An otherworldly point and click adventure arrives on Nintendo Switch and Steam today courtesy of indie developers Lightfoot Brothers. 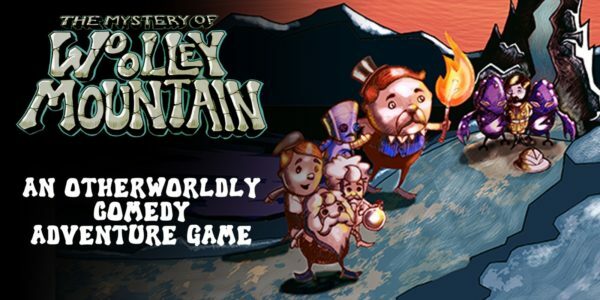 Inspired by classics such as Day of the Tentacle, The Trap Door and the Monkey Island series, The Mystery of Woolley Mountain will take players on an adventure that includes witchcraft, time travel and heroics. The new trailer below provides a taster of the colourful world waiting to be discovered. The Mystery of Woolley Mountain begins with the kidnapping of the children of Woolley Mountain by a malevolent witch, in order to get them back players will need to join a group of time travelling audio scientists and set out on a quest filled with head scratching puzzles. Players will be able to explore a rich and interactive set of environments, and meet a variety of creatures such as beasts, evil witches, confused automatons and strange ropemen. A colourful sprawling universe, inhabited by beasts, witches, automatons, ropemen and other strange creatures. Family content and humour suitable for all ages. A gripping story that sees five scientists set out in their time-traversing Crystal Submarine to destroy the evil witch and rescue the kids. A thirty-track, originally composed, electro-indie synth-pop soundtrack. The Mystery of Woolley Mountain is available now on the Nintendo eShop and Steam, priced £9.99 / €10.99 / $12.99.